And what is the law of Nature? To guard what is your own, not to lay claim to what is not your own, but to make use of what is given you, and not to yearn for what had not been given; when something is taken away, to give it up readily and without delay, being grateful for the time in which you had the use of it. 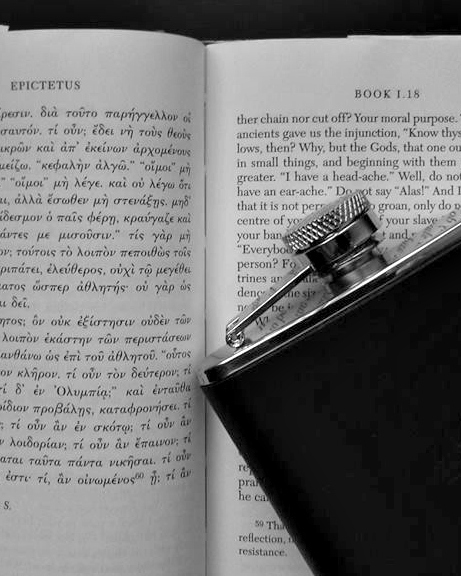 Epictetus always brings his teachings back to the basics. In Discourses 2.16 he lays out the primary Stoic mindset. He calls it the law of God. I went with Nature, which Epic* wouldn't be that concerned with since he was a pantheist. Anyway, this is where he lays down the law. To Stoics, this perspective is law because eudaimonia , a good flow of life, can only be found through adopting a natural approach to life. We believe that the warp and woof of the universe demands a particular approach to itself. For us, Stoicism is a "best practices" manual for the rational mind. The law of Nature is not difficult to state, but it can be pretty hard to practice. There's a lot of, "you must unlearn what you have learned," training involved. Take that first phrase, guard what is your own. To Stoics, your property is a vanishingly small portion of the universe. In fact, you basically get control over your judgments. That's it. Everything else, up to and including your own body, is outside your specific control, therefore you, shouldn't lay claim, to it. At the same time, Stoics are expected to, make use of what is given you. If you have wealth, you should use it justly. If you have an education, use it to build a better world. Stoics are duty bound to live wisely (if we, in fact, have wisdom to use). We are to approach the various projects of our life like an archer views the target. An archer disciplines her every move while she aims, but once the arrow is released, she understands that whether it lands true is in the hands of fortune. Which leads into the next two concepts, not yearning for what we don't have nor pining after that which we no longer have. Stoics train ourselves to be content in the present. If we embrace the idea that we only control our own judgments, it follows that we won't waste time desiring things outside of our reach. Of course, sustaining that Stoic mindset is the main work of our philosophy. It is not necessarily easy. However, if properly applied this outlook makes us profoundly grateful for the time we've had with everything that's come our way. The universe does not us owe us nice things, fulfilling jobs, great friends, or good health. If fortune hands us such things, we strive to appreciate them in the moment. What's more, we understand that the loss of them can not tarnish the past without our permission. I do not mean to imply that Stoics are only content with those preferred things. It was Marcus Aurelius who wrote, "misfortune nobly born is good fortune." Gratitude can be found at all moments in life. To us, fortune is neither good nor bad, it simply is. What's good or bad in this life is you and me. Morality is found in our intentional actions, not in the outside world. If we act according to virtue, we achieve a good flow of life which in turn generates joy. The law of nature is built into the universe. It's the only option given to rational beings. If we expend our energy on things we don't control, we're going to be subject to the whims of fortune. Instead, we can focus on what we do control and leave behind the stress of the rest. With that stoic mindset, we're free to be grateful for everything, content at all times, and full of joy for life. *Yes. I have a nickname for Epictetus. I think it works. Also, we could start calling the Enchiridion the EPIC HANDBOOK, which is awesome. Posted in Stoic Basics and tagged with basic, quotes, mindset. October 16, 2013 by Matt Van Natta.